"My brethren, count it all joy when you fall into various trials, knowing that the testing of your faith produces patience. But let patience have its perfect work, that you may be perfect and … continue reading. Jesus said, If I desire a thing, that is all the basis I need for praying the believing prayer. Note His promise: "When you pray, believe that you receive and you shall have" (Mark 11:24). Jesus did … continue reading. The Ruanda revival is renowned in missionary history. In this excerpt from Mighty Through God: The Life of Edith Moules, Norman recounts this mighty work of the Spirit how it impacted a grieving WEC … continue reading. Question: Some of Norman Grubb's earlier books do not seem to suggest, like his later books, that before we are born again Satan indwells us. Why is this? Did his message change? Answer: Norman … continue reading. I will assume that we are already born-again knowers by God's Spirit (Rom. 5:5). As confessed sinners, in our guilty and lost condition, we found "peace with God" through Christ, who was "set forth as … continue reading. Blessings in the name of our Lord and Savior Jesus Christ. What a blessing it is and was to hear from you. For many years I've been hoping and searching. I am now 49 years of age and as far back as I … continue reading. I don't know how I came to make writing on these lines the pursuit of my latter years--but it has been. Moving on in earlier years from seeking and finding the answer to my personal problems, it … continue reading. We at Zerubbabel Press are excited to tell you about a new book that we are working on. 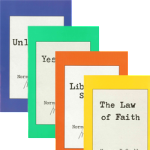 After reprinting seven of Norman Grubb's books (Who Am I?, The Law of Faith, Yes I Am, The Spontaneous You, The … continue reading. I often hear in Christian circles that our goal as believers to is to be more like Christ, to become more Christlike, or some other version of that idea. For most Christians today, this is probably a … continue reading. 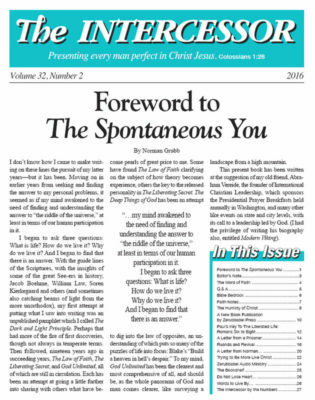 Those of you who are acquainted with The Intercessor know it is a magazine that addresses those who are already believers in Christ. Salvation through Christ is our springboard to launch off into a … continue reading.